As GT7 Motorsports team driver Anthony Gangi Jr. begins to wrap up his 2012 karting season, the young gun would take on a new challenge this past weekend at the New Castle Motorsports Park facility. Gangi Jr. would take part in the inaugural Yamaha Junior Sportsman Money Race during the 2012 Robopong 200, the popular endurance event that features a gruelling 200-lap race for a $10,000 prize and recognition on the "Dan Wheldon Cup" and attracts up-and-coming karters as well as drivers in the Mazda Road to Indy ladder series and the IZOD IndyCar series. With the addition of two Yamaha divisions in 2012 for younger drivers, Gangi Jr. was able to get in on the exciting action and jump behind the wheel of a Yamaha powered kart for the first time in his young career. Leading the way for both of Saturday's practice sessions as rain threatened most of the day, Gangi Jr. showed he had to pace to be the driver to beat. Continuing his quick pace during the afternoon qualifying session, the GT7/TonyKart driver went on to take the coveted pole position with his time of 1:15.397 seconds. Leading the field to the green flag for the 15-lap scheduled prefinal, Gangi Jr. and the off-pole sitter would begin to break away from the field. Rain started to fall on lap six however, ending the prefinal early with Gangi Jr. scored in the second position yet earning fast lap honors. With the first full day of competition complete, Gangi Jr. would need to rest up for the 30-lap race, double the length of a normal race, the following day. Sunday would see the Yamaha Junior Sportsman competitors on the track before the feature Robopong 200 event. Warm temperatures would be cut with a fierce wind, adding to the challenge of navigating the 1-mile facility for the 30-lap final and dash for the $5000 payday. Starting off-pole, Gangi Jr. would hold with the leader early, running nose-to-tail and looking to make his bid for the lead. Eventually losing the leader in the draft, Gang Jr. held on to take second place honors, and again clock the fastest race lap, along with a $2000 check for his effort. Gangi Jr. and his GT7 Motorsports team will next face another huge challenge - tackling the temporary parking lot facility during the 16th running of the SuperKarts! USA SuperNationals at the Rio All-Suite Hotel and Casino in Las Vegas, Nevada. 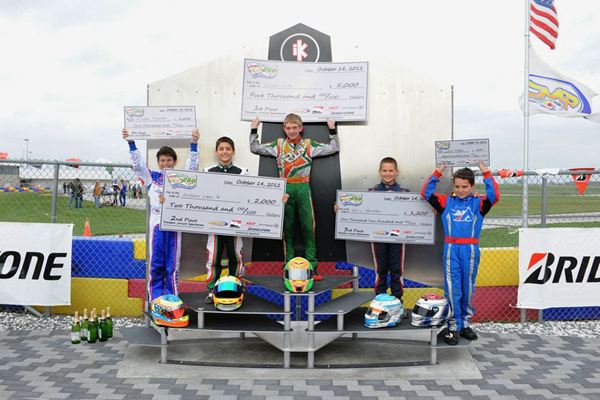 A podium finisher in the 2011 edition of the event, Gangi Jr. will look to take the TaG Cadet field by storm and come away with ultimate SuperNats glory.